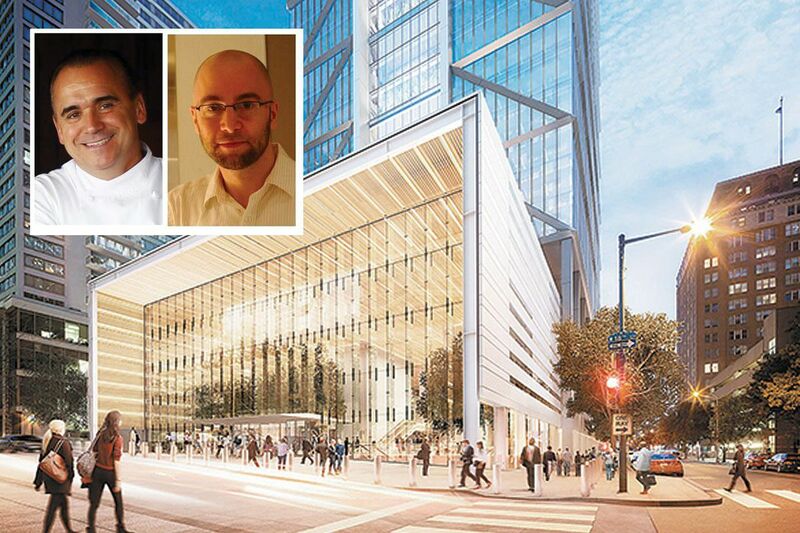 Jean-Georges Vongerichten (inset, left) and Greg Vernick will open restaurants at the Comcast Technology Center. Globe-trotting chef/restaurateur Jean-Georges Vongerichten and hometown hero Greg Vernick — his onetime protégé and the James Beard Award-winning owner of Vernick Food & Drink — will open restaurants at the Comcast Technology Center, now rising above Center City, a representative of Comcast confirmed to The Inquirer. The restaurants — whose names and precise concepts have not been disclosed — are to open in summer 2018, as Comcast and the Four Seasons Hotel occupy the 60-story building at 18th and Arch Streets. Vongerichten's restaurant will be set up at the top, off the lobby of the 217-room Four Seasons, while Vernick will have space at the foot of the tower for his second restaurant, the representative confirmed. Representatives of the New York-based Vongerichten — whose holdings include New York's ABC and Mercer Kitchen, and a series of restaurants bearing his name in Las Vegas, London, Paris, Shanghai, and Tokyo — were not available for comment. Vernick declined to elaborate, given that the opening is more than nine months away. Vernick, a Cherry Hill native and graduate of the Culinary Institute of America, spent five years working for Vongerichten in his far-flung restaurants before coming home with his wife, Julie, to open Vernick, at 2031 Walnut St., in May 2012. The restaurant quickly became one of the hottest tickets in town. In May 2017, Vernick won the James Beard Award for best chef in the mid-Atlantic region. Vongerichten, a native of France, made it to America in his mid-20s to open Le Marquis de Lafayette restaurant in Boston, where he stayed for about a year. At his next stop — executive chef at Lafayette in the Drake Swissôtel — he won four stars from the New York Times. He and a financial partner then opened the acclaimed JoJo in 1991, followed by Vong, and in 1997 the first Jean-Georges restaurant in New York's Trump Tower, a three-star Michelin restaurant.